This month we mark the 20th anniversary of the Help A Little One Foundation. H.A.L.O. was born after our beautiful, vibrant three-year-old daughter suffered irreversible brain damage and moved to a pediatric nursing home for 24-hour care. Gayle and I had the resources to give Sarah all the material things she needed but we soon realized that kind-hearted staffers were spending their pocket money to buy “extras” to improve the quality of life for other residents. We decided to help. H.A.L.O. quickly evolved from giving teddy bears and pajamas to supporting enrichment activities. In 1999 we established Family Circle to reach out to families caring at home for children with severe disabilities. Today our Sunday Swim and Sing activities relieve isolation and provide socialization for these individuals, and we continue to fulfill requests for items such as adaptive tricycles and wheelchair ramps for vans when they will make life easier for the families. Our latest initiative, the Children’s Advisory Network (H.A.L.O. CAN) is helping families dealing with some of the confusing legal regulations that govern the care of their children. We recognize, and pray, that few of you will ever have to live with the outcome of severe neurological impairment. For this reason we celebrate your compassion and kindness over the past 20 years, and thank you for helping us give “little ones” the best life possible. Sarah, the inspiration for the Help A Little One Foundation, is 24 years old now. Since meningitis attacked her brain, her body has grown but her condition is unchanged. She cannot walk or talk. She receives nutrition though a G-tube, takes many medications and endures frequent seizures. Because of her fragile medical condition and severe neurological impairment, Sarah lives at New England Pediatric Care, a skilled nursing facility for young people. The family has come to terms with her condition. Gayle Pinshaw, mother: “I will always wish things could have turned out differently for Sarah, but I have accepted that she is safe, well cared for and as comfortable as she can be. Sarah is more responsive to us now than in the early years. We enjoy that interaction and her personality, although we don’t know how much she actually understands about the world around her. When I speak to her, she seems to recognize my voice and she smiles for me and other family members. When I read stories to her – pre-teen books with plots, now – she often seems focused and intent. Julia Wicoff, sister: “I live out of state so I only see Sarah a few times a year. She seems to know me, so I sometimes wonder: if Sarah knows when we are there, does she know when we are not? It’s hard to think about it. Working in the non-profit world I know it is common for families to start a foundation in honor of a loved one. It comes from a loving place, but it is unusual for it to last more than four or five years. I’m really proud that after 20 years H.A.L.O. is still looking for opportunities to help children and their families. Medical care is not always what you wish it to be, so I am thrilled that Sarah is at NEPC, a facility that will take great care of her, no matter what. Dan Pinshaw, brother: “It is never easy to lose someone you love. Sarah’s case was further complicated by the fact that we never really lost her, just lost the potential for her to live a full and pain-free life. I believe my family refused to make this her lasting legacy. 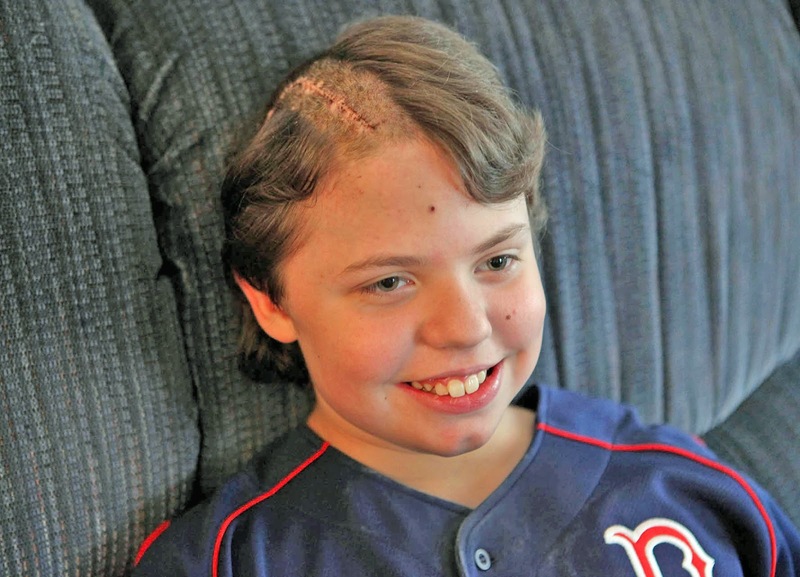 Brian M. will be thirteen in December – a miracle since he was born at 26 weeks, had a stroke, is paralyzed on the left side and lives with epilepsy, a colostomy, and has had half his brain removed. “The brain division was a hard choice (in 2009),” according to his mom, Brenda, “But when you have to do CPR on your child, you do what you can, even knowing there will be loss. No parent should have to lose their child to seizures,” she told H.A.L.O. A second brain surgery in 2012 caused Brian to lose peripheral vision and worsened the already limited use of his paralyzed hand, causing difficulty in walking, even with a device. Brian is doing much better today. H.A.L.O.’s recent gift of a Flaghouse Roadstar II adaptive tricycle enables him to play alongside other children with some degree of independence, she said. This year he was able to attend a medical summer camp on Cape Cod with the family and play adaptive baseball in the Miracle League. “At Seven Hills Pediatric Center, children and young adults with severe neurological disabilities are provided with an exceptional quality of care by our dedicated staff, who bring dignity to each person’s day. With the help of the HALO Foundation over the years, Seven Hills has partnered to provide memorable outings, bring special gifts and supply smiles.” ~ Dr. David A. Jordan, President/CEO, Seven Hills Foundation. “Each year for as long as I can remember, the H.A.L.O. gift to Plymouth Pediatric Center has allowed staff to provide gifts to each pediatric resident at the holidays. Smiles and happy vocalizations abound at the party. One particular incident stands out in my mind. “We are proud to be part of the first two decades of the unique and noble mission of H.A.L.O. to enhance the lives of the most needy of children, and hope that others will do so with us in the years ahead. " ~ Thomas R. Kline, Esquire. “I am writing to express my heartfelt gratitude. I have been using the laptop provided by H.A.L.O. 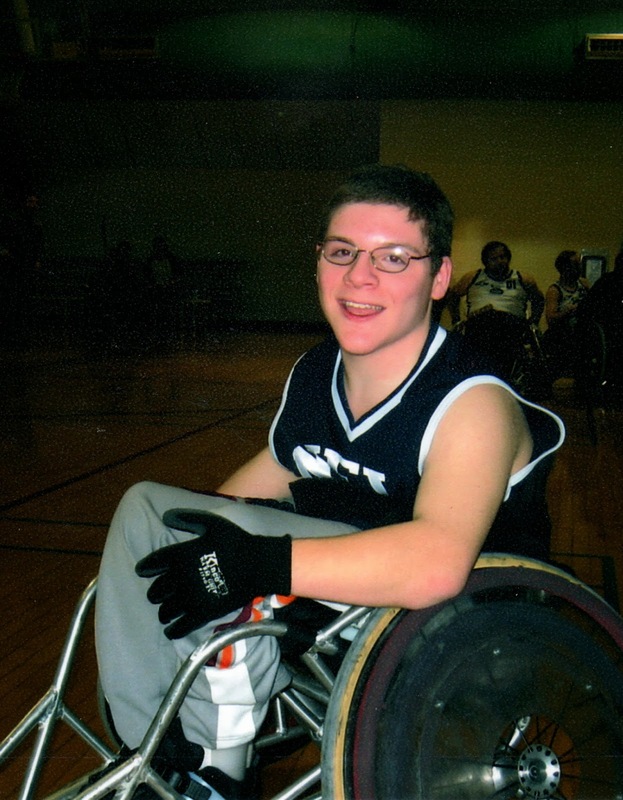 to keep in close contact with the wheelchair rugby team I belong to at the University of New Hampshire in Durham. . . I will always remember your generosity." ~ Daniel C.
Boston’s Jewish Family & Children’s Services to embrace families who are caring at home for children with complex disabilities. H.A.L.O.’s Sunday Swim and Sing program has been the most welcomed and enduring activity. Since 2006 it has provided social and exercise programming to participants aged 6 to 35 who are socially isolated due to physical and communication challenges. 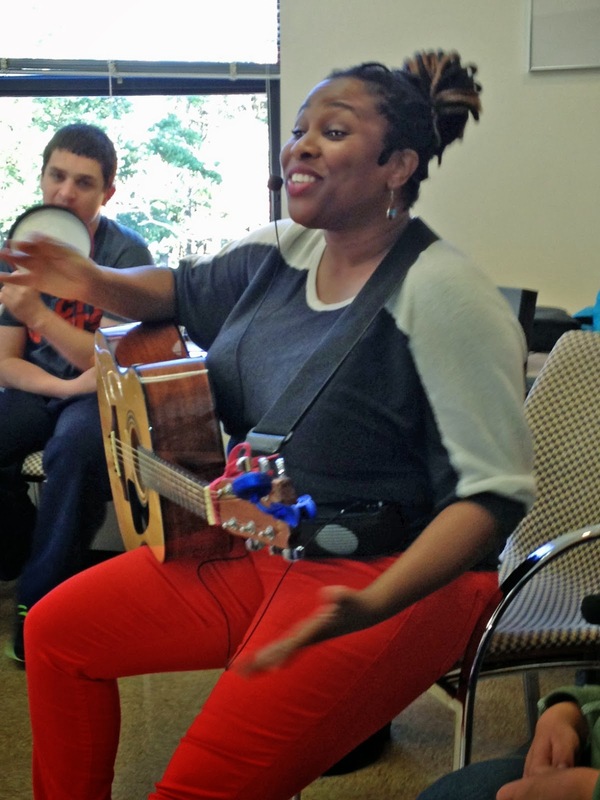 Music therapist Claudia Eliza elicits smiles as she rumbas with her bongos, guitar or tambourine in a room at the Jewish Community Center in Newton MA. Her magical voice engages 12 young people in call and response songs while their 12 professional buddies help them keep time with percussion instruments. After a snack, most participants – even those in wheelchairs –enjoy an hour in the heated, accessible pool with their partners. JF&CS also operates the Sunday Swim and Sing in Stoughton MA under the Family Circle umbrella. H.A.L.O. 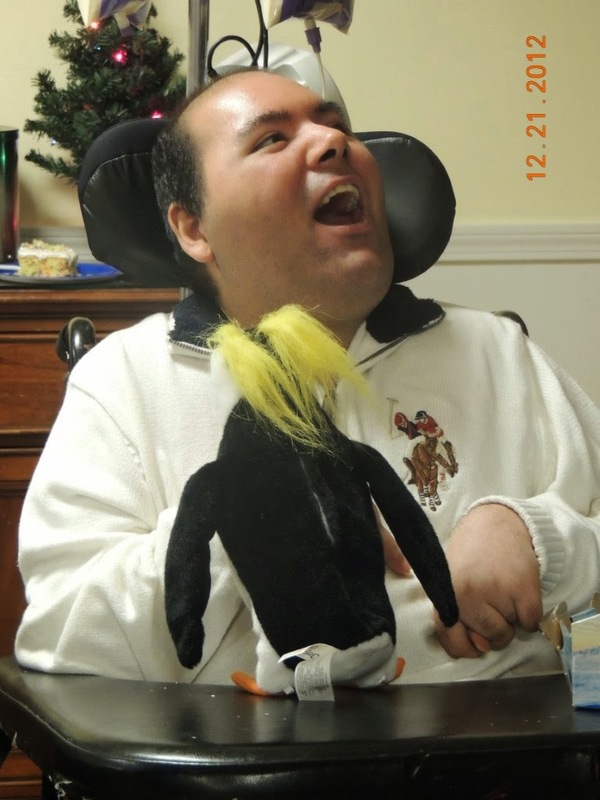 programs are non-denominational and focused primarily on individuals with severe neurological impairment. Newton serves 15 families, 30 Sundays a year. Stoughton hosts 8 to 10 families on 20 Sundays. “We duplicated the program in Stoughton because the need on the South Shore was so large, and some families were traveling over an hour to Newton,” said Sara Freedman, Director of JFCS community Programs and Services for People with Disabilities. State budget cuts have reduced the number of available alternatives, so there is little attrition in either program and the wait list is long, she said. It takes weeks for partners to establish a trusting relationship, especially with non-verbal young people, so alternating attendance or substitutions during absences doesn't work well. JF&CS offers a “Family Swim and Sing” in Stoughton once a month so that families on the waiting list have at least one activity with their child. Center for Children to a medical group home for adults at Crotched Mountain in New Hampshire. Now, the stark reality: It took six years to find an appropriate setting, and it is the ONLY one of its kind in New Hampshire. This story’s happy ending was due in large part to the persistence of Abby’s mother. The team at the Keene, NH pediatric center said Karen advocated, begged, cajoled, negotiated and mediated with a web of state agencies and organizations. 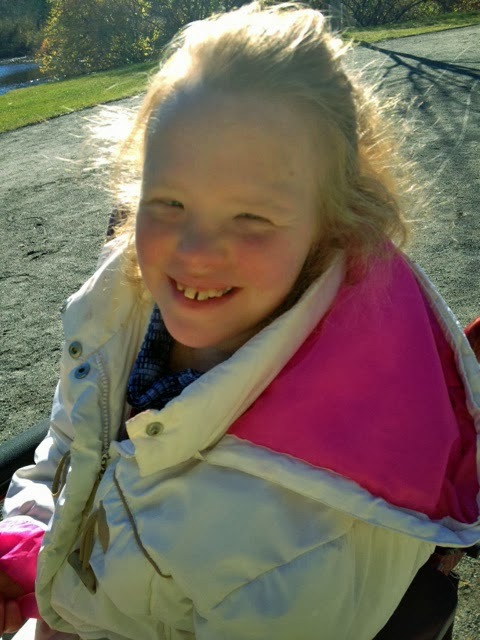 Abby went to live at Cedarcrest at age three after a health crisis. She was medically fragile, dependent on gastroenteral tube feedings for nutrition, needed round-the-clock nursing and was unable to walk. She also had complex developmental needs. Her life expectancy was uncertain, and her family’s main concern was ensuring the best possible quality of life. Seventeen years later, with advances in medical treatment, exceptional medical support, diligent therapy, and consistent routines and expectations each day, Abby’s G-tube has been removed and she has learned to walk, unlike many children with severe neurological impairment. Those huge milestones brought new concerns about her future care and safety. Cedarcrest staff and other transition team members began a multi-year planning process for Abby’s future. 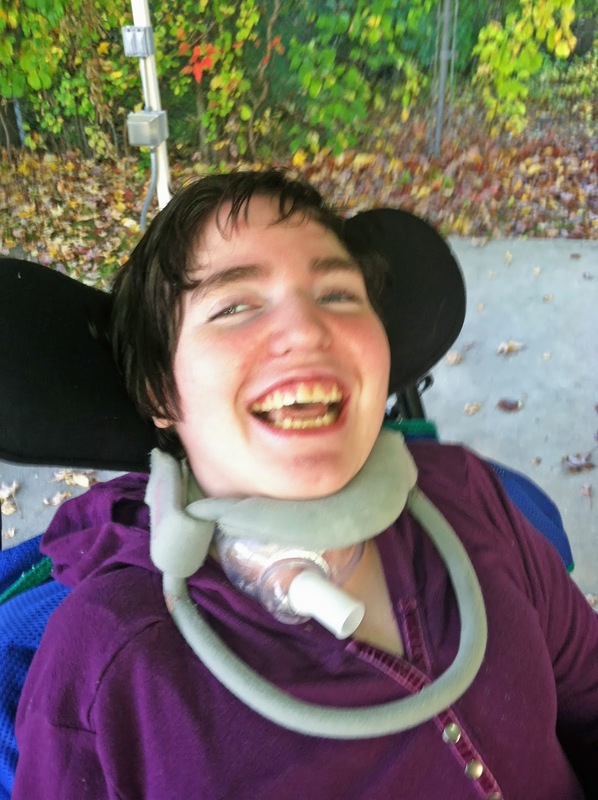 As they explored housing, education and service options for young people with complex needs they discovered that no age-appropriate group home, foster care or individualized service option in the state provided the level of ongoing medical oversight and round-the-clock personal supervision Abby needed, and no single agency coordinated the complex funding and legal issues for life care for severely impaired younger adults. “It was scary. A parent’s biggest fear is that there will be no one to take care of their child, and there was this gaping black hole between pediatric care and adult care,” Karen said. The family also wanted Abby to live with people her own age. Since Cedarcrest was a two hour drive from their home they also hoped for a closer location. “We had to compromise,” Karen said. Reluctantly the family considered a geriatric nursing home with a young adult unit, and even looked into facilities for patients with dementia and Alzheimer’s, since the level of care closely parallels what Abby requires, but none provided everything she needed. Just when the outlook appeared bleakest, Crotched Mountain Foundation of Greenfield, NH announced the opening of the state’s first medically-supervised adult group home. At age 20, even though she had not yet “aged-out” of Cedarcrest’s pediatric services, Abby’s family allowed her to become the first of five residents at the customized ranch-style home. Unlike typical community-based group homes, Abby’s is overseen by an RN program manager, has “awake” overnight staff, and provides on-site medical services. “Abby is thriving. It is still scary for us, because we are both adjusting to new staff and a different situation, but I am confident Abby will live safely and as independently as she is able with exceptional care and the supervision she needs,” Karen said. Crotched Mountain is still a two-hour drive from the family home. “It’s a struggle, it’s never the best, but it’s the best it can be,” said Karen. Learn more about Cedarcrest Center for Children at www.cedarcrest4kids.org.